SAD Lights - DON'T BUY BEFORE YOU READ THIS! The symptoms of SAD usually start in the fall and continue through the winter months. Whether you’re diagnosed with SAD or not the light therapy can be useful to help to treat regular depression and anxiety. It also works to lessen the effects of the change of the season for people that have anxiety and depression but not full-blown SAD. Research suggests that the cause of SAD or worsening depression and anxiety in the winter is related to your biological clock (circadian rhythm). By not getting enough sunlight there is a disruption to your body’s internal clock. 1) Duration- Usually its recommended that you do 15 or 30-minute sessions. 2) Timing of use- Its usually more effective to do the session in the morning. 3) Intensity- You need to sit close enough to the light. Scientific research has shown that light therapy does in fact reduce the symptoms of anxiety and depression. I hope you find this report useful and are on your way to feeling better with the help of a light therapy lamp. Dr Michael Holick is the world’s leading Vitamin D researcher. He recommends the use of light therapy lamps in the chapter on SAD in his book: “The Vitamin D Solution”. Light therapy is also recommended by the Mayo Clinic for treatment of SAD and for other conditions. Please keep in mind that these lamps do not affect your Vitamin D levels. Whats the difference between a light therapy lamp and a normal lightbulb? Normal lightbuls are usually much less powerful than light therapy lamps. They are usually no more than 500 Lux. Light therapy lamps usually start at 2500 Lux and go up to around 10,000 Lux. That more closely matches normal daylight which can be as high as 100,000 Lux. Also the light therapy lamps are more effective because they emphasis light that’s in the blue end of the spectrum (5000k-6200k). You don’t need a prescription for light therapy boxes but its always a good idea to run it by your doctor first. You may need to find out if you need to take any precautions. If you are using the light box to treat SAD you should start using it in the fall when the light changes and the days get shorter. its recommended that you continue to use it through to spring. If you are using it to treat anxiety and depression and not SAD its a good idea to chat with your doctor and get their usage recommendations. Its important to be consistent with the timing of your sessions and to track your mood and symptoms. You may find that you don’t have to use the light every single day to feel the benefits of it. This is especially true if you are treating your depression or anxiety and not specifically treating SAD. Light therapy isn’t mean to cure SAD or non seasonal depression and anxiety on its own. Its meant to be used in conjunction with other therapies like CBT, Meditation, Medication, and exercise. Pros: Perfect amount of brightness. Safe. Cons: Some complaints about quality and that its not as bright as advertised. The Carex Day-Light lamp is an excellent glare-free white light lamp. It outputs 10,000 LUX of light. The Day-light brand is popular in hospitals and clinics and also for home use. It can be placed on your desk and its height is adjustable. You can also adjust the angle which is great because studies show that having the light slightly above you and aiming down is best. It also properly diffuses the light to remove 99.3 % of UV light and uses flicker free bulbs. The Carex Day-light has been tested and meets all requirements for therapeutic use. This lamp is recommended by experts like Dr Michael Holick in a chapter on SAD in his book called “The Vitamin D Solution”. Please keep in mind that these lamps do not affect your Vitamin D levels. 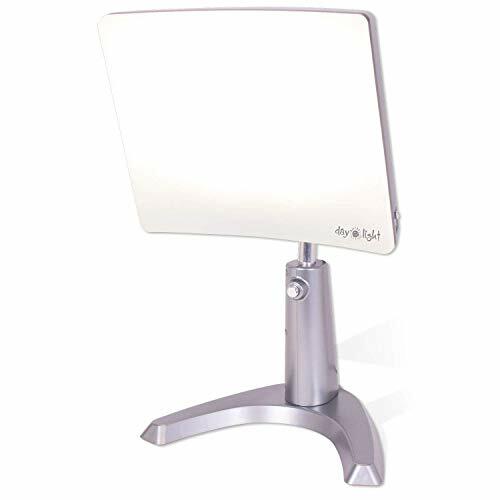 This lamp has a large 250 square inch face and its very bright so you can do shorter sessions. Its my pick for #1 Winner because its highly recommended by professionals and its very reasonably priced. On the downside there have been some issues with quality control and some people are saying its only 10,000 Lux if you sit closer to it than recommended by the company. The reviews for this lamp are generally very positive and the lamp works well so that may not be deal breaker for you. Also, you can return the product if there is a defect so you should be good to go. Cons: No timing functions. Can’t adjust height. Only one brightnes setting. 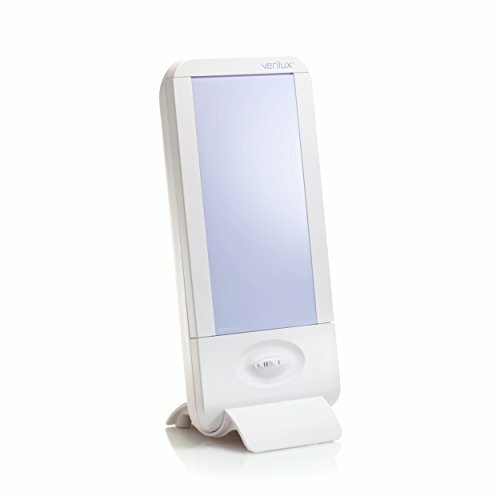 The Verilux is a very good glare-free 10,000 Lux light therapy lamp. It features a wider dispersion shine pattern so you can move around more while you are using it. This lamp is smaller than our #1 Winner and that makes it quite portable. You can only adjust this lamp by its angle and not by height. If thats important to you you may prefer the Day-Light Classic Plus lamp. It outputs a cooler white light than the Day-Light Classic. Even though its portable it still has a large surface area and diffuses light very well. It has a respectable 200 square inch face. It’s my pick for #2 Winner for a few reasons. Firstly, because its slightly more expensive than the #1 Winner. The other reason is because you can’t really angle it down and some studies have suggested that having it shine down on an angle is best. I really like the simplicity and ease of use of this lamp. The Boxlite is a sleek space saving light therapy lamp. Its my pick for #3 Winner because its more expensive than the other lamps in this report. 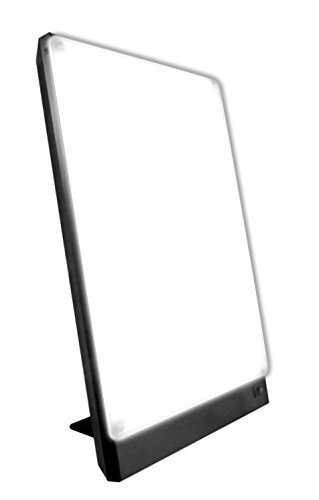 It outputs a powerful 10,000 Lux of UV-free light. It outputs that power at 17 inches distance from the light which is much better than the other winners. You can sit further away from this lamp and get the right amount of light. The lights surface is 180 square inches. It has a warmer light than the other lamps in this report. This is a solid lamp that has many positive reviews. On the plus side this lamp is made from very durable materials. The casing is metal and there’s a long power cable which is very convenient. If you want to be able to get the benefits of light therapy while sitting further away from the lamp, this is the lamp for you. I included the Verilus HappyLight Liberty Compact for few reasons. Mainly because its a very inexpensive light. The other reason is that its so small and portable you can use it anywhere. You can also take it with you on your travels. Its built to withstand the rigors of travel. It only outputs 5000 Lux and it needs to be placed 8-10 inches away from you to work properly. Some experts are saying you don’t necessarily need the full 10,000 Lux of bigger lamps. For many people the 5,000 Lux output works well to alleviate symptoms of SAD, depression, and anxiety. This is a great option if you are sensitive to bright lights and if your symptoms aren’t severe. The HappyLight Liberty Compact has many positive reviews. On the downside, there have been some complaints about the bulb burning out too soon. Light Therapy lamps are a great addition to help in treating SAD, depression, and anxiety. They help to regulate your body’s internal clock when there isn’t enough daylight. Research has shown that they are an effective add-on treatment for many people and not just those suffering from SAD. I hope you found this report useful and enjoy the benefits of light therapy. Want to know more about Light Therapy and SAD? I hand-selected the BEST articles from the BEST Anxiety Experts and put them in an email series that you can have for FREE. I get Thanked for this every day.